Physical Description Most Remans look a like they say, well in the mines of Remus you will certainly know a certain differents between your own kind. How they look is not what matters, how they talk, act and think does. Grax is bald, is about 1 meter and 85 centimeters and weights about 85 kilograms. But don't let looks fool you, this old dog has seen more wars then those Romulans can figure out. As every scar on his body tells its own story of ever battle he stood before, he is a veteran and at the same time a leading example of loyalty. Strong, defensive and tactful. If this man ever comes out of these mines, I would not be stunned to hear that he was promoted to a leading position of a Reman Command unit. He knows what is expected of him and he will complete the mission within its limits or beyond. Personal History Born on 2298 in the depths of the mines of Remus, the crying was calm down by the mother named Eveln. Raxs the father was not there to witness his first born son to be set foot into the dark mines. Eveln was taken care by the Romulan medical team, well as far as care could go towards. In the time that this young one grew, it learned the vital things to stay alive, food, water, strength, defensive and offensive. No these mines were no place for a child like him, yet he learned how to survive these dark tunnels. His younger brother Trex died when a mine collapse, did you know that Remans were put to work when they could stand on their feet? Romulans, pff they did not care if you were 40 years old or just 5 years old, work had to be done and so they did. Grax was his name, a name that ego through the tunnels and mines as he earn his name and pride of his family. Raxs only watch when his first born was fighting for its life. The code is very simple, you get challenge, you accept whatever the result might be. At the age of 16 it was a Romulan Guard that was target for meddling in a battle. Well the death of that guard got Grax almost the death penalty. Almost.. as the head guard saw potential in him and sends him towards the hell named Bootcamp. At 2328, Grax was introduced towards the ice cold lands of Kevratas, the planet was known for its sudden death drops of freezing. While the Romulan officers were warm in their huts and buildings, the Remans were to stay behind and do patrol routes around it. Grax learned there the will to survive under the right weather condition. When the freeze came, dig a hole and get into it and wait for it to past. At 2328, Grax was redeployed at the Imperial Legion at Cort, a place that was taken by force by the Romulans and were to stay ground at the very same place. At 2352 he was promoted towards Elder Slave and later on he was challenged by the Reman Master by a insult made by himself. He made it swift and the death made him the next Reman Master, responsibility over all Remans at that planet. Then the Dominion came, for a while they did nothing and the fools even made a treaty with the Dominion. Grax knew there was a battle coming, soon the Remans were going to be used as cannon fodder and he was damn making sure that was not the case for him and his remans. 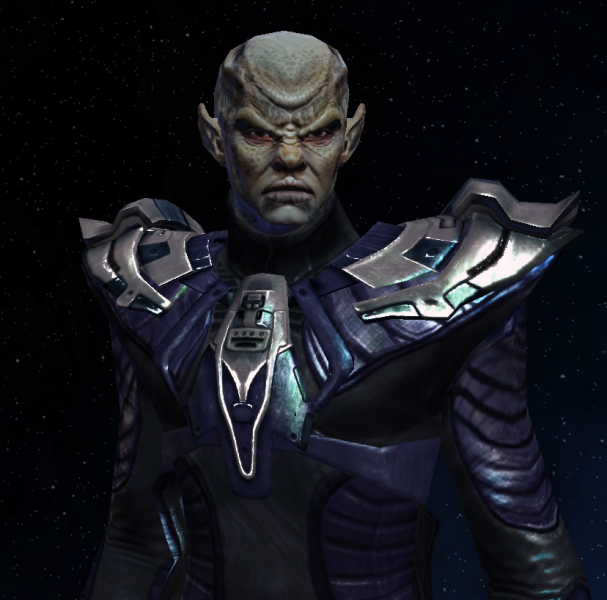 He was soon involved in taking over Gastrat, Minrsk and the Romulan outpost Orisk. Heck they even took Outpost 432, a wealthy outpost that was once a Federation claim. Many battles that all ended up at the hands of Cardassia. Many Remans lost their life's there, but Grax troops were selected as one of those special once's and survived quite a lot of battles. After the battles, after the war they were selected to go back towards the darkness they came...Remus. For years he stayed there and worked at he side of his old man Raxs to do what every Reman did. Mine and mine some more, after a long period a Federation Transport came to save them? They left from Remus with the USS Neco, away from the system as the Supernova went overdrive taking the old planets with it. From 2387 till late 2388 he served the Romulan Empire as a Reman Commando onboard the IRV Imperiax. He had seen the dark side of the Romulan Empire on numerous occasions as they stood by to defend the Romulan Empire true nature. After their last mission, Grax took his step to do something different. While he had great respect for Commander Volus, he wished to continue his story elsewhere and gain experience from something new. He found the Star fo India quickly after crossing the borders and requested to join. - Fought at Outpost Gastrat, 432 (Federation occupied by Dominion), Minrsk, Orisk.